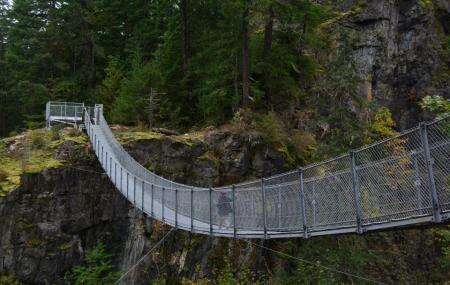 Find hotel near Elk Falls Suspension Brid ..
Elk Falls Suspension Bridge is one of the most picturesque places to visit in Campbell River, Canada. The Suspension Bridge was made over the canyons in Elk Falls Provincial Park. Following a long route of trails meandering through the forest, you will come across this long suspension bridge. A walk over the bridge will provide you gorgeous views of the park and the fall. A great walking tour. Very well marked out. There was no garbage in site which is amazing. Lots of bathroom facilities. The views were great of the falls and river. Ample parking. Cute little suspension bridge!! If you're in the area I would recommend checking it out. There is a viewing dock that faces the water fall and it's amazing to see how steep it is. The suspension bridge does not sway back and forth and is rather sturdy. It's like a mini version of the ones in greater Vancouver. Well built bridge. Doesn’t wobble side to side much. Doesn’t bounce around too much either. Views are good from the bridge. Easy access to parking from main road. Clean or gravel pathways with beautiful scenery. Hikes are good for kids and grandparents. Lots of stairs and some steep sections from the bridge.